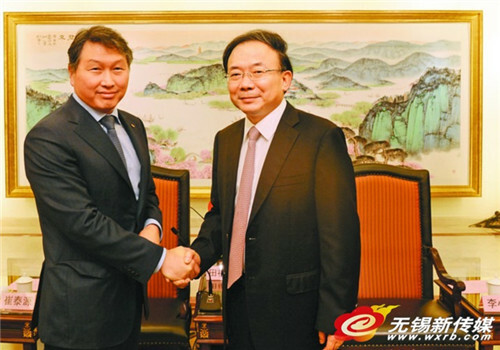 Li Xiaomin, the Party secretary of Wuxi, Jiangsu province, had a meeting with a delegation from the South Korean conglomerate SK Group headed by the Group Chairman Chey Tae-won, on August 28, the Chinese-language Wuxi Daily reported. Welcoming the delegation, Li praised the visitors' support for Wuxi's development in recent years. He pledged to provide continuous support and create a sound industrial environment for further expansion of SK investments in the city. The signing of the FTA between China and South Korea would further expand the bilateral cooperation in the future, which would also constitute a base for SK’s further development in Wuxi, Li said. He hoped that the SK Group would take the opportunity to bring more projects to the city. SK Group had invested more than $10 billion in Wuxi in 10 years, said Chey, adding that SK would bring more investment and leading technologies to the city. SK, whose main businesses include energy and chemicals, information and telecommunications, as well as trade and services, had also acquired Hynix in 2011, one of the world's largest chip makers with plants in Icheon, Cheongju in South Korea and Wuxi.